Thank you, Lainey. ‘Cubby hole’ is such a great term – we had a cubby hole cupboard in our kitchen. 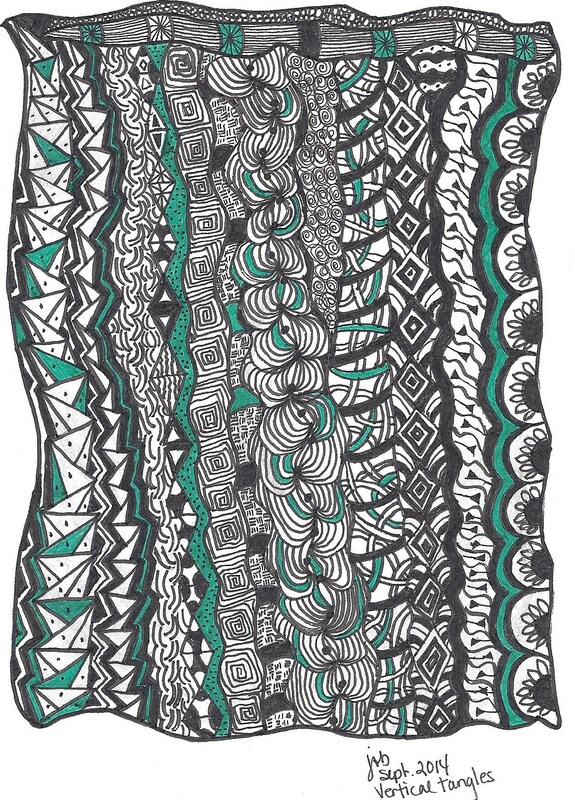 Do you know who’s the South African contact person for Zentangle? Is that where you are? For some reason, all this time I thought you are in Australia! 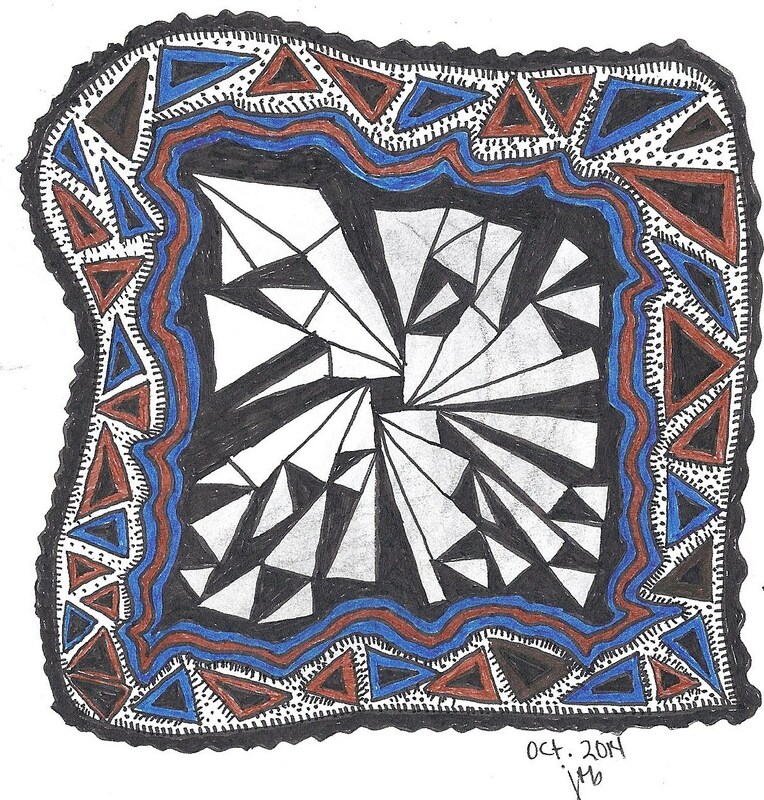 I don’t know whi the CZT is, but go to http://www.zentangle.com and click the contact link at bottom of page to compete their email form OR email rickandmaria@zentangle.com. That is the official site, and Rick and Maria certify all the CZTs so they should be able to help you. Well whatever you imagined these are rather splendid. I love your zentangles! Thank you, Jude. I think Christian Loubouton could start a line of tangle pumps 😊 the black and white patterns with the trademark red sole would be quite dazzling in those chi chi store windows! Oooh, maybe you should sell that idea to him. Sounds amazing! Thank you, Susan. What’s keeping you busy these days ?? The green one is my favourite – would make a great textile print. Wrap yourself up in a sarong, next summer. Love the description of the linen closet. I recall poking (snooping, exploring, getting myself into trouble – you choose) around the shelves in our storage closet off the bathroom en route to the attic. Mom kept the fancier linens here. The kind that came in thin cardboard boxes, pastel colours, with a rabbit logo. Wabasso, I think? It would make a pretty summer wrap! Thanks, Maggie for visiting. Linens are very alluring, especially when stored in boxes with tie ribbons. Not that I have anything that fancy but I DO have an imagination – clean, uncluttered closets and so forth! I love the use of vertical stripes! Thanks, Jane. For some reason vertical patterns are easiest for me – probably all those years of working with ledger paper! I hope you are doing well – i will swing by and catch up on your adventures! You are so talented, and I love the back story. Lovely. With me it was the basement, stuffed full of hidden treasures and forgotten secrets. My mom is a “pack-rat” (not quite so bad as to end up on an episode of “Hoarders”)…I still find mementos from years gone by down there. I think most of our parents ‘saved’ and ‘recycled’. At the time we helped my parents downsize, we had to accomplish it quickly so no time for exploration, but even in their much smaller condo, there are a couple closets stuffed with … the stuff of life. I salivate at some day being able to dig into it, hopefully while they are here to answer questions! Thank you! That’s high praise from one of my favorite artists ! Those are beautiful. I love the patterns and the way they repeat, but not quite. Not bound by rules but sticking to a theme. Anyway, that’s what it says to me. Thanks, Dan. At this age all endeavors seem to have looser constraints, mostly because I can’t see well enough to tow the line in the sand or stay within the lines on the paper! Sammy D., I love your two tangle patterns and designs. The green one, my favorite! Reminds me of a weaved rug I bought when I lived in Greece. Now stored away, but the good memory stays! I’d love to see more of your sketches! Thank you for the encouragement., Christine 😊 glad I could trigger a Greek memory! I love the energy of both, Sammy (but green is my favorite color, so the second is my favorite). Your remembrance about your parents’ closet probably triggered something in most of us; my mom used to hide Christmas presents in hers, but I liked surprises, so I didn’t go in there much. Thanks, Sandi. You’re the second reader to use the word ‘energy’, and I appreciate your insight. I don’t feel like either a credible writer or artist so there’s always discomfort the moment I press the publish link! Today’s kids seem so much more plugged in even in early years. I hope I live long enough to see them as mature adults to ask if childhood held as many mysteries for them. I live in New Mexico and authenticity is a must in collecting native american indian art, so I appreciate your post. I enjoy many that you write, especially anything about boomer related issues. I have a blog related to such and wanted to mention that tomorrow, Nov. 23, I’m posting a piece entitled “Remember This? Cat Stevens album Tea for the Tillerman (or miles from nowhere and back again).” It’s timed to the release date of the album in 1970. I thought you might appreciate it. I invite you to read it and write back with your thoughts! Hi Mike – thank you for your kind words and interest. it’s ironic – I was never a Cat Stevens fan, and yet, several of his songs hold great historic meaning for me as they tie to a specific project and friendship from way back when. I look forward to your post tomorrow. Thank you forvletting me know! Are these examples of your sketches?! Wow. I’m always in awe of anyone with artistic creative talent. I have none. I think both of your sketches are wonderful … but the green one is more intricate. It appears that we all have ‘special’ places in our childhood homes that held an allure. For me it was a hall closet with held my parents’ stuff … as opposed the second closet with our things. I still occasionally dream about the ‘mystery’ contained within that closet. Hi Joanne – yes those are my sketches. I have zero drawing/sketching/painting talent. Well at least it’s still deeply buried, but I’m learning tangling to transition from left to right brain because I dance and write, so I know there is juice on that right side to sketch and paint. It’s simply finding my way to that gateway. Isn’t it interesting how we all can tell about ‘mysteries’ in our childhood homes. Is that part of every childhood or was it more prevalent for us growing up in an era where parents weren’t as open about many things? I hope I live long enough to ask future generations if they thought so many things were mysterious to them! That’s a good question! I hadn’t thought that it might simply be something about our generation. My sister and I often talk about how secretive our parents were and how they quickly shut down any question that they thought was none of our business. So strange that today children are encouraged to ask questions and be curious when we were reprimanded for it!! I think my parents thought they were shielding us from worry, but when we didn’t understand what was going on it just made us imagine the worst. Looking back, I wish they had talked more about several things, and I think now they wish they had. Finding the balance is hard. We are fortunate if most of our memories are good ones. I’m glad yours are ! I definitely think it’s best not to investigate to thoroughly into those kinds of childhood memories: reality often winds up being disappointingly prosaic…But I love those kind of memories, I have a ton from my visits to my grandparents. They had an old house and a huge gardens and there were all sorts of nooks and crannies that seemed full of magic and secrets. The second one is my fav; I like the braid patterns, it pops three dimensionally. Beautiful. Now, if only they could tell us their secrets, what inspires such designs. There definitively are all sorts of patterns going in all kind of directions — maybe speaking of broken lives put back together, or trying to. Lovely. Thank you, Silvia. I was touched to hear you muse on the meaning behind the patterns and designs! They’re supposed to be soothing to do, Sammy? Do you find that? I really love the first one 🙂 Nice, the blanket connection. Thank you,Jo! They are soothing to do, but I hunch further into my comfy chair and often end up with stiff neck because I forget to stretch or get up and move around. But, oh I love how they draw me in. Thank you! I appreciate your visit.